When you find yourself staring at a basket of peaches or a pile of cucumbers, you might find yourself thinking that the key to canning them successfully lies solely in your crazy-good cooking skills. Well, part of it does. You do need the ability to follow a recipe, boil water and use a kitchen knife without doing bodily harm. But beyond that, I believe that true success in canning has less to do with knife skills and more to do with a mind set (with a few canning tips thrown in for good measure). I believe that having a few of these “secrets” in your back pocket will help you gain confidence and flavor when it comes to putting up food. Now, just to be clear – I don’t think that the key to successful canning has anything to do with special equipment. In fact, no fancy tools are required to be a good canner. Oh sure, there are tools that can make your life easier (a wide-mouth funnel or a large ladle, for example). But they are certainly not necessary to success. Like most of you, I usually can with just standard kitchen tools and I improvise when I need to. So what are the secrets to success? Well, let’s assume you are starting with a solid recipe that follows standard USDA recommendations. Why? Because they are time tested and follow safety guidelines with a large margin for error. By starting with such a recipe, you are safe and can be assured that you have a good chance of your jam gelling, your pickles pickling and your tomatoes staying within the safety zone of pH values. A solid recipe is definitely key to your chances for “success”…IF success is a jelly the gels. It all depends upon your definition of success. Yes, a solid jelly is success. But so is a runny jelly with incredible flavor! The flavor is the success! Eat true to the seasons and Mother Nature will provide exceptionally delicious produce. 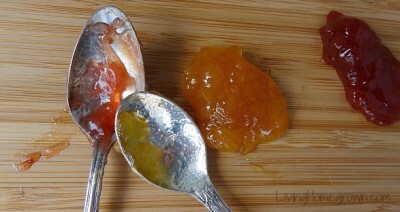 Yes, you can doctor up a bland, hothouse strawberry jam or a mediocre, shipped-across-the-country citrus marmalade. (A splash of brandy and some lemon zest are tricks for creating more flavor.) But if you start with the good foundation of flavor found within seasonal produce, you will have success with much less effort. Stick with homegrown or locally-grown produce and the complex sugars and flavors are all at their peak. That way, your canned product will reflect the best of the season – which is sort of the point. Be willing to try things outside of your comfort zone. Shake up your taste buds a bit and try new fruits, new combinations or a whole new type of preserving. Think of it as a culinary adventure. When you visit farmer’s markets, check out the pluots/apriums, purple beans or anything else you might not normally buy and test some recipes. 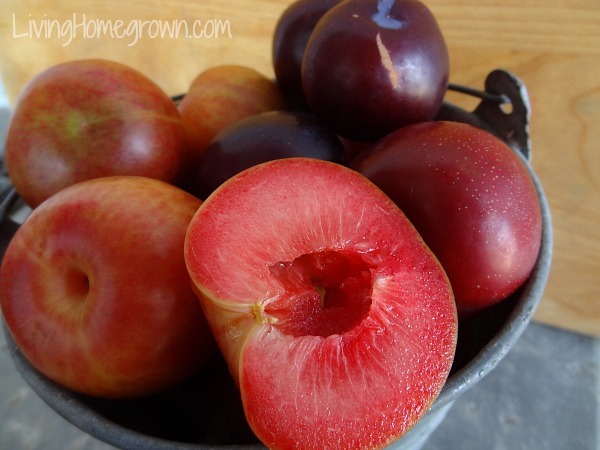 Have a friend with a fruit tree? Having an abundance of free produce is the perfect time to experiment. Offer to pick the fruit and create jelly, syrups, jam cocktails or flavored water kefir to share. Or go beyond the canning jar and try your hand at something new like dehydrating or fermenting veggies. There is so much more to preserving than just jam. Go forth and dive in. Part of using your sense of adventure is to try different herbs, spices and even citrus zest in your canning projects. No matter the recipe, it is okay to add herbs and spices for flavor enhancement. Doing so will not affect the safety. Try the flavor of lemon verbena, rosemary, lavender or even fennel in some of your recipes. Not sure if the flavor will work? While cooking your recipe, mix a spoonful with the herb/spice and taste before adding it to the whole batch. That will give you an idea if you like it or not. But here is an important point: Always use the freshest flavorings possible. If your cinnamon is 6 year old, it just will not pack the punch you are expecting. Rotate out your old spices and use fresh herbs whenever you can. It really does make a difference. 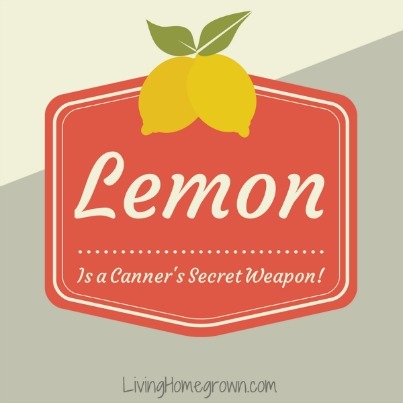 Yes, lemon juice is used a lot in canning to adjust the pH of a recipe and to balance the acid to get the gel. But if I ever make a fruit recipe that doesn’t call for it, I add a squeeze of fresh lemon juice anyway. I do this with jam, jelly, marmalade, whole fruit, spread, sauce, syrup, etc. Why? Because just as salt enhances flavor in savory dishes, lemon juice brightens the flavor in sweet dishes. It gives it a bit of zing. It is subtle, but it is there. If you want more “zing” to a recipe that already has lemon juice, add lemon zest instead. You won’t mess up the acid balance but will help the fruit flavor shine through. In other words, don’t add so much of something that you no longer taste the fruit. This goes for herbs and spices (more is not always better) but this is especially a problem with sugar in recipes. Yes, most jam/jelly recipes are loaded with sugar because it is needed to get the gel. You can NOT just reduce the sugar. The recipe will not work. However, you CAN try your hand at low and no sugar recipes. They use other methods for gel and they can really let the fruit flavors shine through. (You can read more about how to reduce sugar here and here.) Low sugar preserves may not have the vibrant color of high sugar recipes (sugar acts as a color preservative) but they more than make up for that with their high impact flavor. You can use temperature to get the gel or use a low-sugar pectin such as Pomona Pectin. I do still make a few high sugar recipes, but most of my recipes are low or no sugar types. Canning in a group is a great way to put up a lot of produce in a short amount of time. The finished product can be shared without feeling like it was work. But beyond that, canning builds friendships, family and memories. You have probably heard that our sense of smell and taste are both hard wired into where we store memories. This is why the smell of apple pie makes us think fondly of our grandmother or the smell of pine reminds us of Christmas. When you can with others, you create those wonderful memories that are rekindled every time you open the next jar. That gives you have success beyond the flavor in that jar. Chime in! 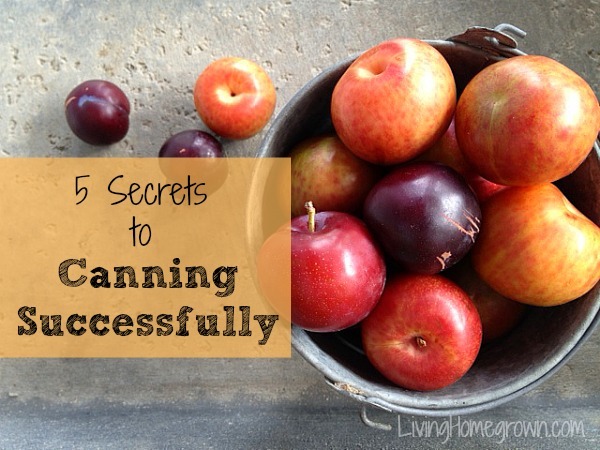 What other things do we need to be successful canners? Courage and intestinal fortitude! That’s what I needed when learning how to pressure can. Just plain old guts. I grew up hearing about pressure cooker explosions and the dreaded deadly botulism, so when I decided I wanted to be more self-sufficient I had to get over those fears! I still have that little voice lingering in the back of my thoughts, but that’s okay because it makes me so much more careful while I am pressure canning. So far I have canned salmon, beef and chicken. Now I think the world’s the limit and I can’t wait to try more recipes! Thanks for your information and inspiration, Theresa. Oh courage is a good one Vickie. I like that! Yes, pressure canning does take a bit of a leap the first time, doesn’t it? I think having a solid understanding of how/why the techniques work is a huge confidence builder. That is honestly why I do what I do with this blog, my classes and the TV show. I want to help people with understanding the science behind the techniques because THEN you know what to do when things go wrong. And you can make choices knowing what is safe and what is not. Thanks for your comment and kind words. I so appreciate it! Thanks Theresa for your newsletter and inspirational, dependable information about canning. I started canning several years ago after learning about Virginia by traveling to the farms and orchards during peak harvest seasons for produce. Then the joy of being in an orchard with trees laden with ripe fruit overtook rational sense becoming both my bliss addiction and soul medicine. What did I know about processing 60 pounds of tart pie cherries after a gorgeous summer morning of picking fruit with my husband! My most treasured achievement was winning two ribbons in the State Fair for the cherries and a chutney. That moment of recognition connected me in to the most profound way to my grandmother and to all the female ancestors who have preserving food and providing sustenance since the beginning of time. Thank you for your work in keeping up connected to what is real and important. Thank you so much for taking the time to tell me that. You made my day. And congrats on the State Fair ribbons! Whoot!! Do you have a pressure canner that you can recommend? I like the All American brand of pressure canners.